My sister in law Emily gave me the great idea to do a gift guide for nonprofits and charities this holiday season. Working for a nonprofit, I have the pleasure of seeing acts of generosity every day, and no time is as sweet as the holidays. It inspires me to support causes I believe in and reminds me to give back all year long. My favorite thing about philanthropy and charitable giving is that every dollar really makes a difference, and these days, you can see exactly where your donation will go and how it will have an impact on the group you choose. Donations in someone's name are a thoughtful gift, especially if you have a friend who's crazy about cats, reading, clean drinking water in developing countries, etc - there's a nonprofit for that. Leukemia and Lymphoma Society - I have many friends who have raised money through marathons for LLS, and loved ones who have benefited from the ground breaking research being done there. LLS supports every part of the patient experience and creates thousands of volunteer opportunities. Local hospitals - I am totally biased as I work for a hospital, but with bias comes information. Give locally and know that every cent of your donation will go to the program or service that took care of your grandpa, baby niece, or best friend. Depending on where you live, your hospital might be doing research and medical trials of its own, or requires funding to keep special and imperative programs afloat. DonorsChoose.org - I was blessed with a great education and lots of resources at school, but my mom taught in low income schools for years and had to provide basic necessities for her students. DonorsChoose.org allows teachers to post projects and materials, and gives donors the power to select their favorites and follow the process until the students have what they need. Heifer International - Is there anything more fun than giving someone a sheep or chicken for Christmas? I don't think so! Not only is it a cool gift, but it provides so many resources to the area receiving the animal (or other basic needs). It means that they're able to build up their own economy, provide food, clothing, and shelter, and sustain themselves for years to come. Watsi - Crowdfunding is pretty hip at the moment, and while others were funding their concert tour or next novel, Watsi was creating a ground breaking opportunity to bring health care to developing nations. For as little as $5, you can support individuals in their specific medical needs. Watsi has funded over 800 patients in a few short years. Humane Society - Taken care of ill, neglected, and abused animals is especially important when the temperatures drop around the country. The Humane Society provides lots of options for support - donations, volunteering, and adoption. International Rescue Committee - Biased again (as one of my best friends works for IRC in Africa), but I have learned through her how incredible their programs are. IRC helps to rebuild communities following crises, and provides support and resources on the road to safety. In Boise, a wonderful nonprofit supporting refugees is Create Common Good, which works with refugees to teach them how to grow, farm, sell, and cook their own food, creating jobs and healthy communities. ACLU - For me, civil and equal rights are at the top of my priority list. ACLU works to preserve the rights and liberties for all Americans. A few other rights non profits that I follow are The Trevor Project, Lambda Legal, and HRC. 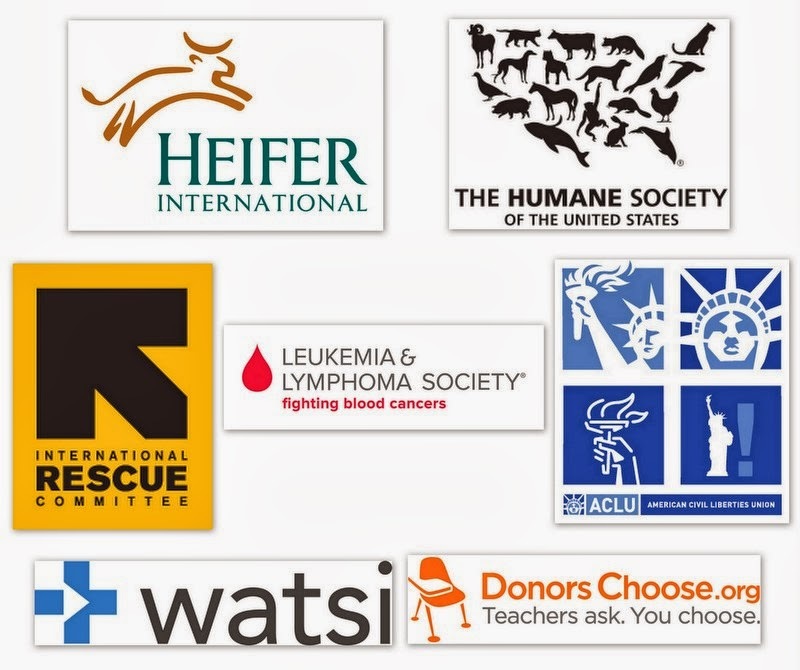 Do you have a favorite charity that I should add to the list? Happy gift giving! This is awesome Zoe! Thank you so much. SO many good choices!